Taco Tuesday, or Street Taco Tuesday, at Pareidolia Brewing Co. in Sebastian, Florida. SEBASTIAN – Last week, we checked out Taco Tuesday at the Pareidolia Brewing Company in Sebastian. The brewery calls it Street Taco Tuesday. Taco Tuesday seems to be a growing trend among restaurants in Sebastian, and now a brewery has added it to their menu. 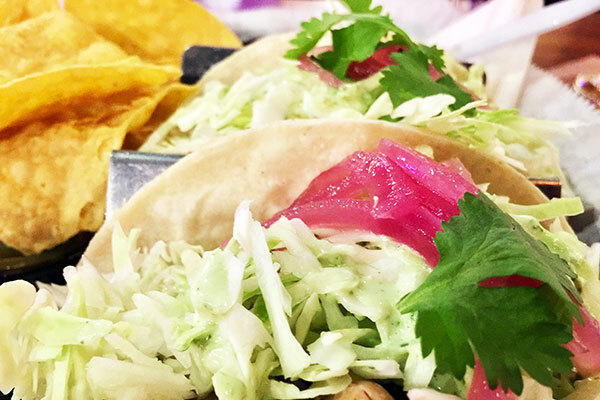 We recently featured Chubby Mullet’s Taco Tuesday after an exciting dinner. Pareidolia’s Taco Tuesday is well planned, and the menu items offer a bit more than what we’ve seen at other restaurants. Instead of just tacos, they give you an entire meal! You can also order a Burrito Bowl if you’re not into tacos. The Burrito Bowl has all the taco ingredients piled up on a mound of yellow rice. The Street Tacos are a style that’s more adapted to life on the street. They are smaller soft corn tortillas and open-faced to show off their contents. 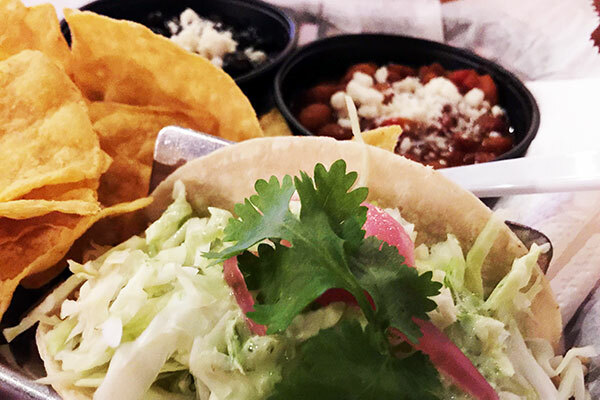 The Street Taco Tuesday menu offers two tasty taco fillings and your choice of beans. You can choose either chicken or pork. The chicken is seasoned, and the pork comes shredded. The taco comes topped with shredded cabbage, pickled red onion, and a drizzle of cilantro lime creme. You can choose “Charro Beans” or “Black Beans” with your tacos. Charro Beans are also known as Cowboy Beans. These are pintos simmered with fire roasted tomatoes, bacon and chili for a hearty smokey flavor. “Black Beans” need no introduction. They are seasoned and delicious. 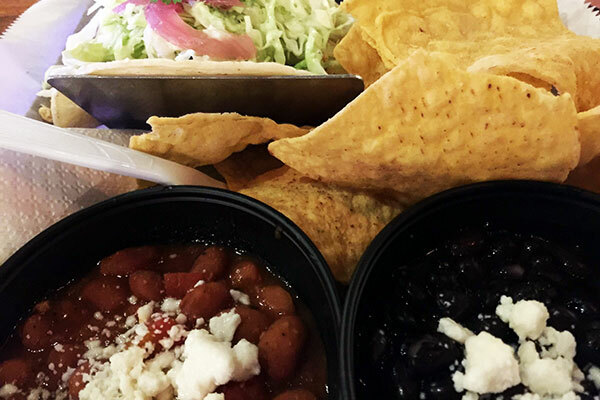 You get all of this, and crispy tortilla chips and salsa for only $8.50. Street tacos have fresh ingredients. Taco Tuesday at Pareidolia was amazing. Cowboy Beans on the left, Black Beans on the right. We ordered chicken and pork tacos. We also ordered both the Charro Beans and Black Beans, which come on the side. From the start, very delicious. Everything was fresh, and we enjoyed the flavor. The tortillas were thin but just enough to hold everything in them. We enjoyed both the pork and the chicken tacos. They are both equally tasty. As for the beans, we didn’t care much for the Black Beans. However, those Cowboy Beans were excellent! You can eat them on the side or put them on your tacos. 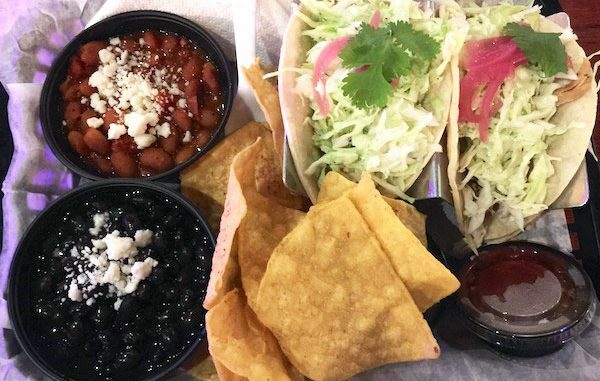 If you haven’t been to Pareidolia for their Taco Tuesday, we think you should give them a shot; you’ll love the food and enjoy the pub experience. 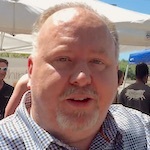 If you don’t drink beer or wine, they have plenty of other non-alcoholic beverages. Pareidolia Brewing Company is located at 712 Cleveland Street in Sebastian, Florida.